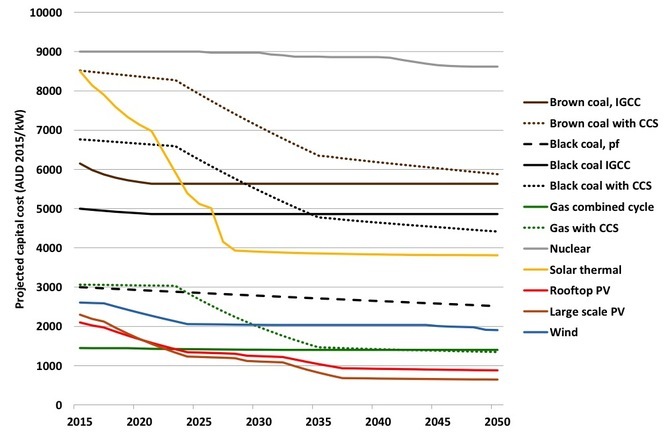 By 2030 renewable energy sources such as solar and wind will cost a similar amount to fossils fuels such as coal and gas, thanks to falling technology costs, according to new forecasts released in the CO2CRC’s Australian Power Generation Technology (APGT) Report. The report also shows that technology costs will fall faster under climate policies that limit the concentration of carbon dioxide in the atmosphere to 450 parts per million. (The current CO₂ concentration is around 400 parts per million). While the practice of forecasting is often derided, with multi-billion dollar assets that can last 50 years or more, the electricity industry and the policy-makers, academics and stakeholders who study it have no choice but to get involved. A key input to all energy crystal-ball gazing is the cost of generating electricity, and performance data. However the last comprehensive update of electricity generation costs was the then Bureau of Resource and Energy Economics’ Australian Energy Technology Assessment (AETA) in 2012 (followed by a minor update to selected data in 2013). The lack of consistent up–to-date data disadvantages technologies such as solar photovoltaic power systems whose costs have been improving rapidly since then. To avoid misrepresenting the possible future role of fast-moving technologies, many analysts have had to slowly abandon use of the old data and create their own more up-to-date estimates. While diverse opinions are sometimes useful, a proliferation of inconsistent alternative cost data sets creates confusion for the industry as it makes each published study less comparable. The delivery today of a new and consistent electricity cost data set therefore is an important and long awaited addition to the electricity industry’s toolkit. The new report was conducted over the July-November period and utilised an electricity industry reference group of around 40 organisations to provide input and feedback along the way. Given the often heated debates in Australia around energy sources, the CO2CRC recognised that it is crucial that studies like these are conducted in an open and unbiased manner. The report includes key “building block” data such as capital and operating costs, and performance data such as emissions intensity, water usage and expected usage rates. Whenever a new electricity generation technology cost and performance data set is created there is an opportunity to update our view of the relative competitiveness of each technology. This is calculated using a measure called the Levelised Cost of Electricity (LCOE). The LCOE captures the average cost of producing electricity from a technology over its entire life. It allows the comparison of technologies with very different cost profiles, such as solar photovoltaic systems (high upfront cost, but very low running costs) and gas-fired generators (moderate upfront cost, but significant ongoing fuel and operation costs). The LCOE is the best technology comparison measure available but is not without limitations. It cannot recognise the different roles technologies might play in an electricity system (e.g. such as supplying everyday, baseload power, or power for periods of peak demand) or the relative flexibility of plant to increase or decrease power supply as needed. Accepting the limitations, the updated LCOE analysis finds that in 2015 natural gas combined cycle and supercritical pulverised coal (both black and brown) plants have the lowest LCOEs of the technologies covered in the study. Wind is the lowest cost large-scale renewable energy source, while rooftop solar panels are competitive with retail electricity prices. It is interesting to note that all 2015 LCOE estimates are higher than the current wholesale price of electricity of around A$40 per Megawatt-hour. The reflects reduced demand in the electricity network, which is putting downward pressure on electricity prices. 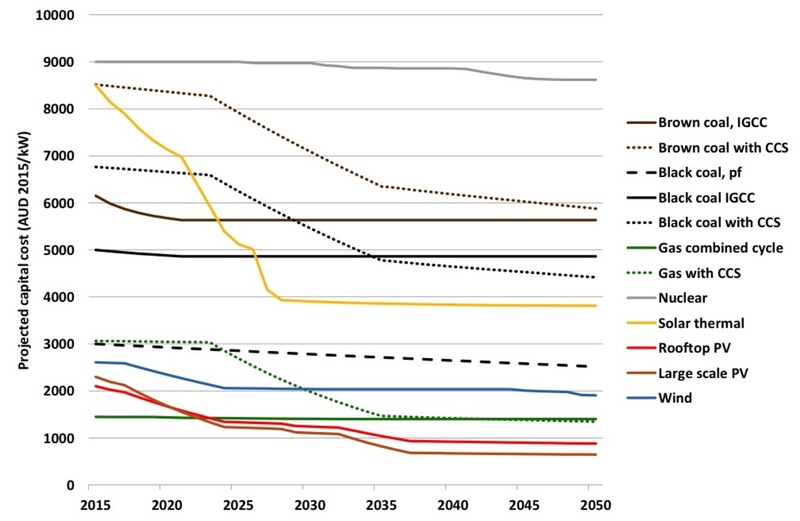 By 2030 the LCOE ranges of both conventional coal and gas technologies as well as wind and large-scale solar converge to a common range of A$50 to A$100 per megawatt hour. This outcome is consistent with observations from many commentators noting that the continuing reductions in wind and solar photovoltaic costs must inevitably lead to an intersection with the costs of the existing mature technologies before too long. Of course, equality in LCOE will not necessarily translate to an equal competitive position in electricity markets, given differences in the flexibility of renewable and conventional coal and gas plants (which LCOE does not capture as already noted). The convergence of conventional and renewable energy costs depends on the capital costs of these energy sources. These were modelled for the new report by CSIRO’s Global and Local Learning Model. This model is a relatively objective way of projecting costs based on historical learning rates. Learning rates show that for each doubling of installed capacity of an energy source, costs fall by a particular amount. We can model these costs across different climate policies, as you can see in the chart below. CSIRO’s projections included carbon price signals consistent with either concentration of 550 parts per million or 450 parts per million of greenhouse gas emissions. However, we found the total amount of cost reduction was fairly similar, but more accelerated in time, by approximately five years, in the 450 ppm case. With the future policy environment of the electricity industry potentially becoming a little clearer after the COP21 meeting in Paris next week, the new report makes the job of understanding the role of different technologies in that future a little easier. The link below is to a very interesting article concerning a landscape buried beneath the Antarctic ice that is similar to the Grand Canyon in size. It also plays a significant role in the current Antarctic ice melt. As my holiday draws closer my plans have changed yet again. Back in November 2009 I rolled my right ankle badly and it has not yet recovered to the extent that it would allow me to do a lot of bushwalking – especially on slopes. So this has meant a complete rethink of my upcoming 2 week holiday. The theory of travelling to Wagga Wagga before heading to the New South Wales south coast has now been scrapped. I simply won’t be able to do the walking I had hoped to do. Now I am looking at a road trip – and I’m not too sure just where the roads will actually take me. I will be on the road for 7 days and had thought that a quick trip to Kakadu was a possibility – but it would have to be a very quick trip (and probably without stopping). So that isn’t going to happen. OK, so the above two days are still very similar to the original plan. It is after these two days that things have changed. Instead of turning to the east, I’ll be turning to the west. I just haven’t yet decided as to where.